A month out from Scrag's Peter Pan party, production is in full swing. I envisage this War Dance* being led by some adult willing to make a fool of themselves lead the fun (probably my husband). So I looked online to find out about hiring an Indian War Bonnet*. Damn, those things are expensive to hire! I reckoned I could make a decent enough job of one myself, with my trusty glue gun - and I was right. It took me all of ten minutes, and cost next-to-nothing. I'm also making a single-feather version for each of the "braves" - which they can then take home with them. * I got mine from Geoff's Emproium for .50c a metre - and it was even stretchy! Determine the size by wrapping the webbing around your head; allow some overlap for gluing. Apply hot glue along one side of the overlapped webbing and quickly press together. Once glue is cooled and set, attach the feathers with hot glue to the inside of the band as shown. Make sure the tallest feathers are at the front. Multi-coloured feathers make for a more impressive headdress! Attach the two white feathers hanging down, on either side of where the wearer's face will be. Use the same type of webbing; measure the length by wrapping it around your child's head. 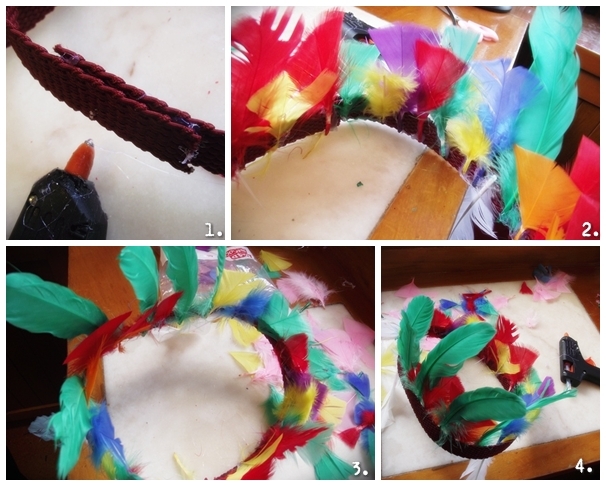 Create the basic headband as shown above. Hot-glue a tall feather onto the inside of the band. If your child insists on putting the feather at the front (when you meant for it to be at the back) that's OK. Let the kids wear them however they want. In fact, instead of making them all the same (like you intended to) you can individualise them by sticking a tuft of different coloured feathers on to the front of the tall feather. Now there should be no mix-ups about which belongs to who. *Disclaimer: In no way is this headdress or my planned party games meant to be culturally insulting to Native Americans and their traditions or costumes. This is meant for a "Peter Pan" Birthday Party for three and four year olds. "Indians" feature in the classic story by JM Barrie, and both the Disney cartoon film and the 2003 live action version. I have no idea whether my humble little feather headband might be stepping on somebody's culturally sensitive toes, but if I am, I sincerely apologise. No insult or slight was intended. I am from New Zealand. I have no idea whether I am being accidentally politically incorrect! Just saying. Nice - flip, a month out from the event! You are organized! I realise that there are offensive stereotypes present in the original Peter Pan, and that they've only been magnified in many of the treatments. That doesn't mean you have no choice but to perpetuate those stereotypes in order to share the story with children. I saw a production of the play a few years ago which replaced the 'Injuns' with Amazons -- kickbutt awesome ladies clothed entirely in feathers. It was such a wonderful creative solution, and I guarantee you not one of the kids in the audience was disappointed by the lack of racism. So if you really want to play with feathers (and I don't fault you that; feathers are awesome), there are plenty of ways to do it that don't involve trivializing deeply spiritual aspects of somebody else's living breathing culture and teaching children that it's acceptable to do the same. OK Emmet, I hear you. 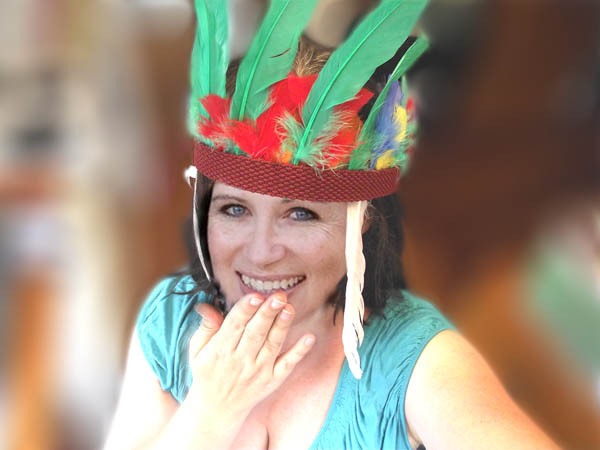 I actually did have NO idea that feather headdresses and Indians in Peter Pan would create any controversy AT ALL; the disclaimer was actually added in after a particularly rude comment where I was left wondering what it was about my pictures that could have caused such nastiness...? An American reader suggested that it may have been the cultural factor. As a New Zealander I had NO IDEA. We have Maori culture here in New Zealand and it is nothing but celebrated. Honestly, I think changing the "Injuns" in Peter Pan to Amazons is just political correctness gone mad. And next thing you know Amazons would be emailing me complaining about that too. Thanks for taking the time to make your point, but I won't be changing anything. I'm not a racist just a Kiwi. We are very mixed culturally here in New Zealand; Pacific style and flavour has crept into everything and nobody gets precious about it, so I would never have imagined a fuss over feather headbands. I have nothing but admiration and respect for Native Americans whose culture seems very beautiful to me (though i know only what I've seen on documentaries and Movies like Dances with Wolves)... and I love Peter Pan just the way it is.